Is your home starving for an Ultra-Modern TV that is an inspired work of art? The Beovision Eclipse TV from Bang & Olufsen might be exactly what it is craving. “It’s a bold and clear design statement of picture and sound in perfect alignment, creating something even greater than the sum of its parts.” Eye-catching, bold, and beautiful, the TV is an all-in-one entertainment system that combines B&O audio with the innovative technology of a 4K HDR OLED screen. The aesthetics feature an organic aluminum soundbar that sits on the front of the thin razor sharp black glass. Only a quarter inch thick at the top edge, the slim modern design is an impressive sight. Capable of delivering unimaginably vivid colors and absolute black, the screen comes in 55 and 65 inches and offers an authentic viewing experience that draws you into an alternate reality. “HDR (High Dynamic Range) with Dolby Vision™ is a technology that dramatically expands the range of both contrast and colour. Bright parts of an image get even brighter, which in turn gives your image more depth.” –Bang & Olufsen. Viewing adventures can be accessed from platforms such as Spotify, Amazon, Netflix, YouTube, and countless others. 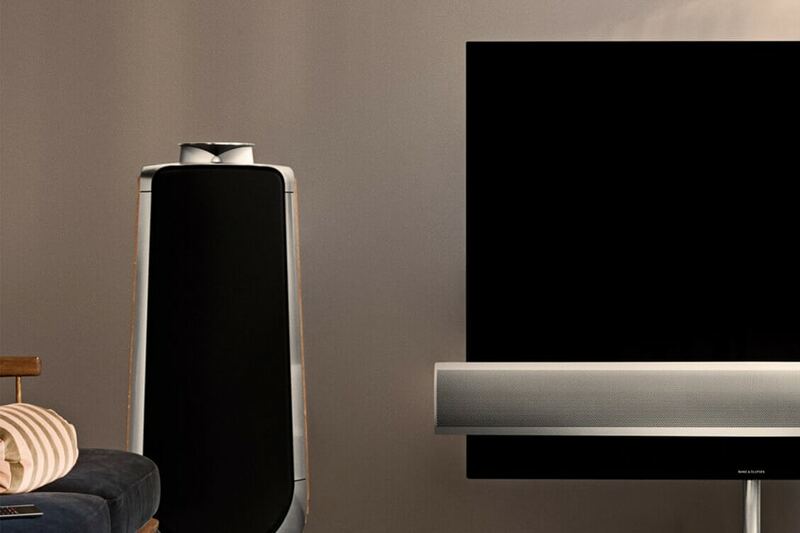 Bang & Olufsen, famous for ultra high-quality sound, offer the same acoustic precision in the Beovision Eclipse TV as you would expect in their line of audio speakers. 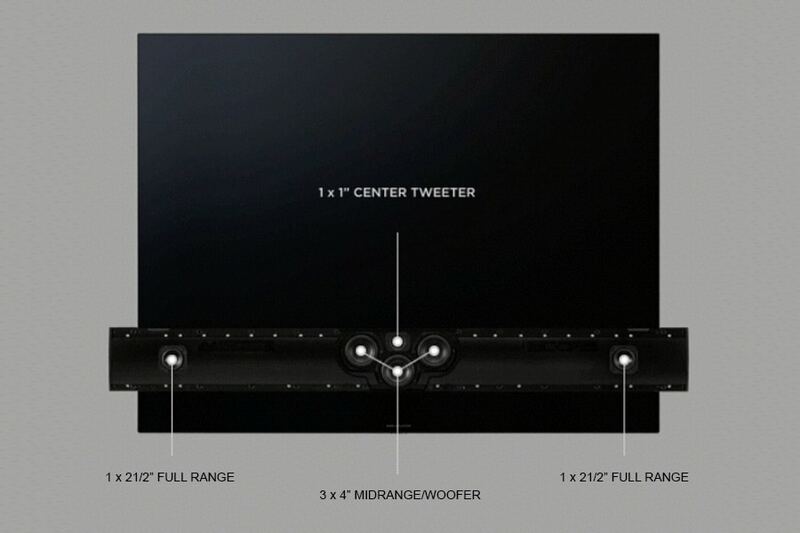 “The Sound Centre features an integrated 450 watts 3-channel speaker system that outperforms even the most potent soundbar on the market. Its ability to deliver speech-optimized centre channel audio as well as powerful stereo performance – all at once – makes BeoVision Eclipse an exceptionally flexible solution in any audio setup.” The soundbar even has decorative options that are temporary and changeable. If your design scheme for a certain season requires blue or red, then you can snap on a cover. The Beovision Eclipse is stylishly flexible. Beovision Eclipse features two placement options. The Iconic Planet floor stand allows the screen to rotate to a range of 180 degrees. There is also a Floating Wall Mount option in motorized or manual. 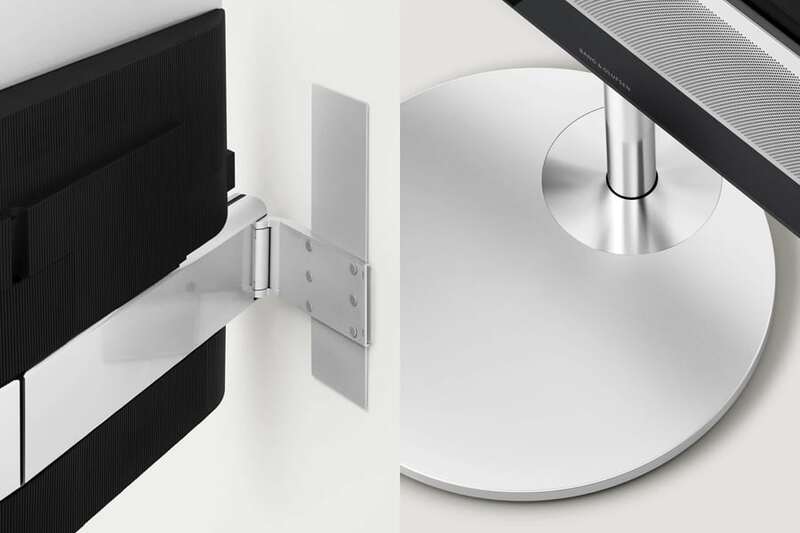 The hinge can be mounted on either side to allow the screen to move up to 60 degrees from the wall. The entertainment system comes with a single remote control, which offers an interface with Bluetooth, Chromecast, and Airplay, and can connect with up to 8 additional B&O speakers for complete surround sound effect. Groundbreaking viewing technology, “pixel-perfect picture” and precision sound engineering, in an exquisite package makes the Beovision Eclipse the ultimate choice. This is the full entertainment package. If you love the unique sophistication of Bang & Olufsen, you will want to include this piece of glorious technology in your home entertainment design. If you would like to learn more about smart-home automation and Responsive Living, feel free to connect with us. We will be happy to schedule a demo with you.